In the days of the old Scottish Highland clans, a tradition existed whereby after a battle had been fought, a cairn, or pile of stones, would be raised in memory of those who had fallen. As the years progressed, locals would add a single stone to the cairn every time they passed by, as a way of acknowledging their fallen kinsmen, and of preserving their memories. 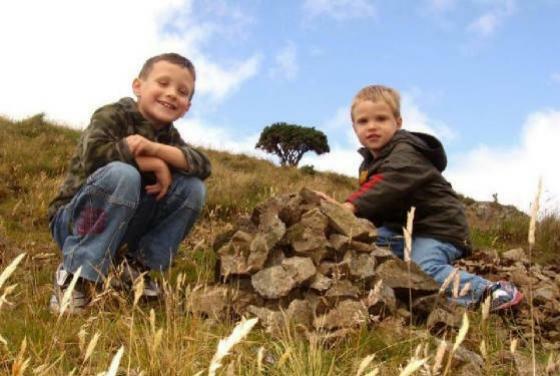 This project is the modern equivalent of those ancient cairns , dedicated to the ancestry of Calum Graham Paton and Jamie Christopher Paton, which comes predominantly from the Celtic countries of Scotland and Ireland . An old saying tells us that the Irish Sea is what links the two countries, rather than what divides them, and nowhere is this more apparent than in Calum's and Jamie's ancestry. Many of their ancestors have crossed to and fro over the sea through the centuries. Some were Scots Gaelic speakers, many spoke in broad Scots, whilst others were fluent in Irish Gaelic, with recent generations all English speakers. Their political affiliations have constantly changed, as have their religious beliefs and practices. This project was designed for Calum and Jamie. Hopefully they will learn from their past that the way forward is not to listen to the political and religious rantings of their own ancestors - for their stories are all massively different - but to find their own way.